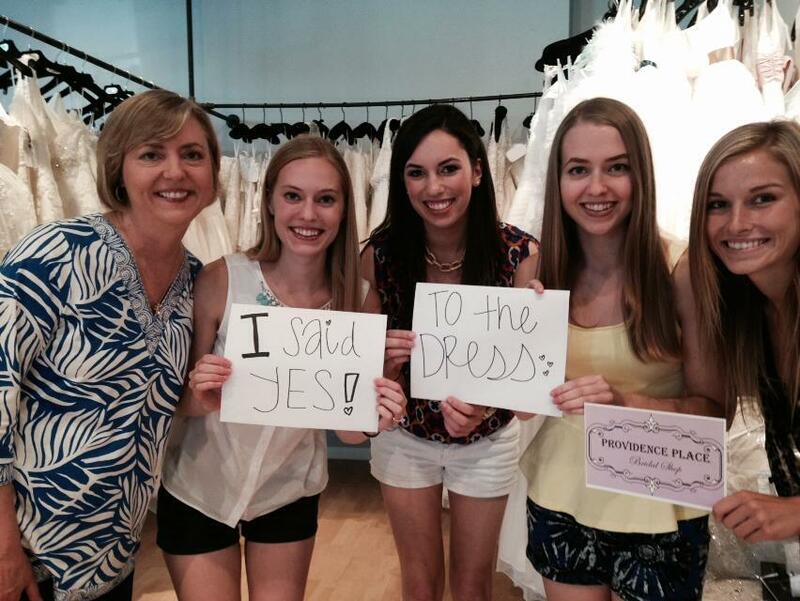 Here are just a few of the many testimonials from our Provi Brides and girls. We are known for our exceptional customer service and making our brides feel special. If you’re unsure whether Providence Place is right for you, read some of these testimonials, and come visit us! Providence Place gave me the greatest experience finding my gown for my sorority’s formal! Everyone ended up loving it and made me feel like a princess! I highly suggest Providence Place for any formal, wedding, or prom event. This shop is so cute and has a great selection of designer gowns at affordable prices. I had been looking for one particular dress and came to this shop to try it on. I came back several more times to make sure it was the right one for me. I wanted some major alterations done to the dress after I ordered but wasn’t sure if they were even possible. One of the Provi girls took their sample dress and met me at a seamstress to talk through the alterations before I made my decision to buy, couldn’t believe how caring they were. Did not make me feel pressured to buy at all. Truly wonderful people. Provi worked wonders with my bridesmaids’ dresses. I was able to pick out a style and color I loved from their designer. Most of my girls live out of town, but that was no issue for Providence Place. They took basic measurements for my girls over the phone as well as processed payments. The dresses arrived in to the shop and Provi even shipped out the dresses to my bridesmaids out of town! The whole process was so smooth and I felt a sense of relief. Thanks Provi Girls. I bought my veil from Providence Place! My wedding was in South Florida and it was absolutely gorgeous! I tried [the Casablanca gown] 1914 in a different store- but I liked the service in your store MUCH better. Would like to order from yall if possible. I just wanted you to know that I had the best Homecoming anyone could ask for! Everyone thought my dress was beautiful. I was the only one with this dress, there. Providence Place went above and beyond to help me find my perfect dress. The staff stayed on top of the designer to make sure my dress arrived in a timely manner and was everything I wanted. Couldn’t be any happier with the treatment I received. Truly a great place with a very friendly staff. I was nervous when I saw the word ’boutique’ on the door but was shocked by the great dresses and amazing price point. Found my perfect dress below my original price point! Thank you! Thank you! Thank you ladies of Providence Place for conducting the fabulous fashion show at our recent RWL Holiday Luncheon and thank you, you gorgeous RWL models for strutting your stuff around the Maggiano’s banquet room!It was enjoyed by all – you all “ROCKED” as we “ROCKED THE HOLIDAYS!